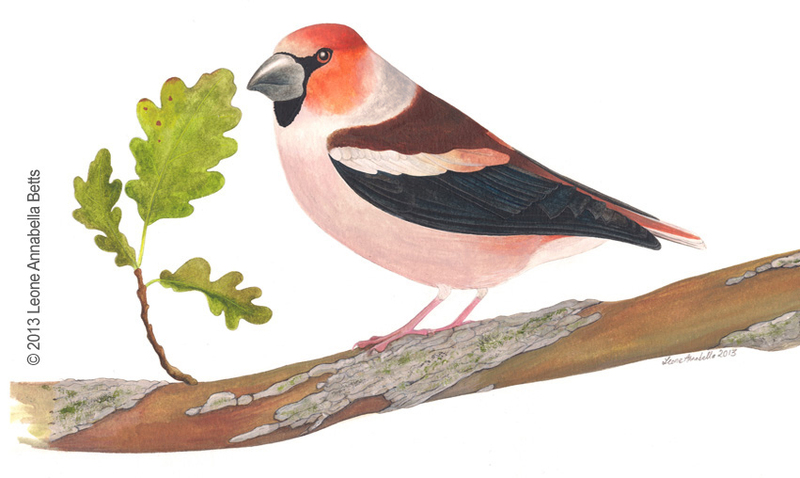 One of the more taxing pieces of work I’ve had to get done this month is an ornithological painting of a hawfinch (Coccothraustes coccothraustes). Now, I have to say I don’t often do birds. As far as scientific studies go, I have a far greater leaning towards the botanical. I like plants. I don’t wish to get all silly, but on a good day if I close my eyes I can almost feel them – that sense of reaching for the light, of growing, of raindrops running down stems and of petals shifting in the breeze. All this helps me paint. But not so with birds. Birds are unpredictable… quick and quirky and (obviously) without roots. I have no natural affinity with that, though of course I do love seeing them. There’s very little in the natural world that I don’t love seeing, but that’s not the same as feeling you want to paint something, or indeed, suspecting that you could capture the spirit of the thing – draw a little window to its soul. Nevertheless, as we are all living in a world where money must be made and the wolf must be kept from the proverbial door, a hawfinch was what my client wanted, so a hawfinch he must have. Below is a small picture of the completed study, which, if you include sketches and preparatory work, took three days. The medium I used was gouache, though I also added a touch of pencil (3H) just to sharpen some of the detail. I don’t always find the addition of pencil useful, but this study was created from a selection of photographs rather than life and so lacked natural light. I have no idea whether other artists suffer from this, but I do find that painting a real thing in real light is so much easier when it comes to creating contrast and bringing out minutiae. It’s also easier on my eyes.